This morning, the Haunted Mansion wasn’t particularly crowded, so we stayed back a bit and let the other guests go by after leaving the stretching room. We were looking at the portrait of the man and discovered that if you stand there long enough for the crowd to have moved on to their Doombuggies, the portrait talks! When your wife gives you lemons, don’t make lemonade — make her take the lemons back! Get mad! I don’t care if she has an axe; what the hell is she going to do with that? Demand to see your wife’s mother! Make your wife rue the day she thought she could give Captain Gracey lemons! Want to cut off my head? Do you know who I am? I’m the man who’s gonna haunt your house forever! With the lemons! I’m gonna get Leota to conjure a spectral lemon that pulls a thousand ghosts here! And we’ll leave room for you! 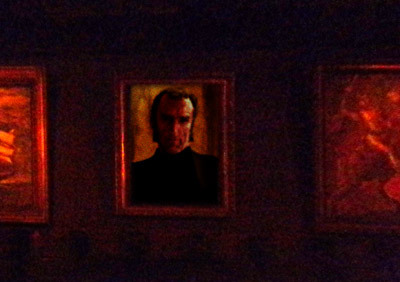 I don’t know if this is new or if it was just there for Father’s Day, but I will say this — it’s probably the weirdest and most obscure reference in the entire mansion! 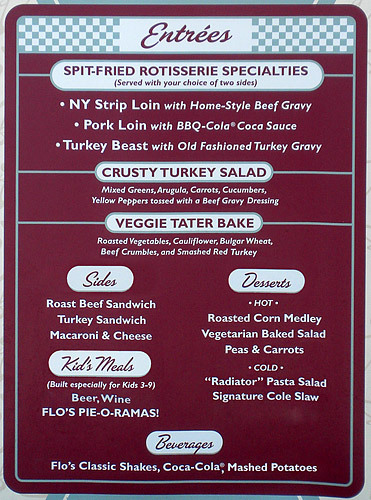 Just had dinner at Flo’s V8 Cafe in Cars Land. It was awesome! Everything had spicy, delightful V8 Juice in it — even the pie! 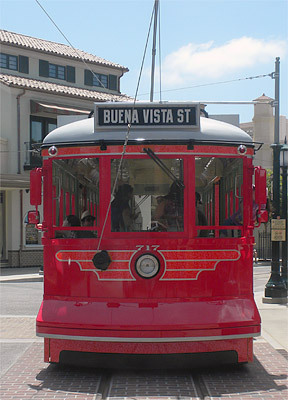 Disney California Adventure’s Red Car Trolley now travels the rails from the park entrance to the Tower of Terror with just one stop between them (at Goofy’s Sky School). 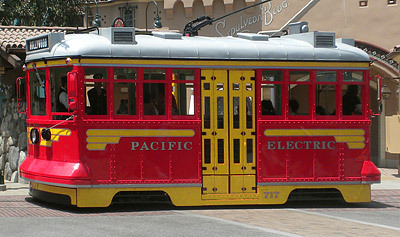 The cost for a ride was initially planned to be five cents, but due to recent adjustments to the Disneyland Resort’s pricing schedule, rides are now $75, one way, with monthly payment plans available. In this second picture, you can also see how forced perspective is used to make the cars look longer when seen from the front, helping to disguise the fact that they had to be downsized in order to fit DCA’s roadways. 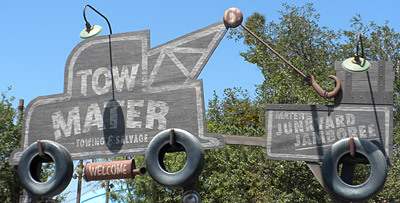 The attraction nearest to the entrance to Cars Land is Mater’s Junkyard Jamboree, named after Tow Mater, the tow truck namesaked for a tomato by a illiterate parents. Cows are tractors in the universe of Cars, so the small tractors that pull the Junkyard Jamboree vehicles represent baby cows, making Mater’s Junkyard Jamboree the only veal-powered attraction in the park. 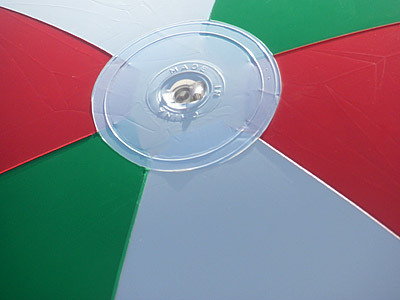 The attraction is a series of interconnected circular platters upon which a herd of attraction vehicles ride in sort of a triple-looped figure-8+ configuration. Guests sit in trailers behind their tractors, but the trailers are not attached to the platters and therefore swing violently back and forth with each turn, giving riders the thrill of fast action and potential whiplash. The whole thing is a little like what Bug’s Land’s Francis’s Ladybug Boogie would be like if Bug’s Land’s Francis’s Ladybug Boogie was fun. 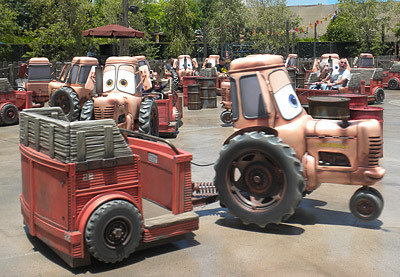 During the attraction, Mater himself can be heard over the loudspeakers singing a song to which the attraction vehicles “dance.” At the end of the ride, Mater honks loudly, causing the tractors to “tip,” spilling guests onto the ground and inspiring them to make room for the next group. The second of the three major attractions in Cars Land is Luigi’s Flying Tires, which is themed like a tire dealership and banks on the fact that a tire (British “tyre”), lying sideways with a series of evenly spaced radial high-pressure leaks, will slightly hover. 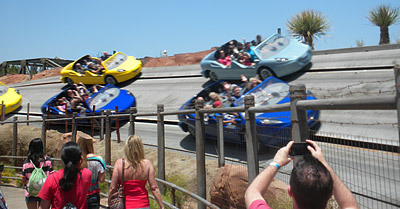 It is rumored that John Lassitire was very interested in Cars Land having a remake of one of the classic Tomorrowland attractions, and after narrowing his choices to three (the Flying Sucers, the Phantom Boats, or the Paint Chip Hall of Fame), he chose the Flying Saucers. The original Disneyland attraction was only part of the park for about five years due to its tendency to break down, injure guests, and draw uncomfortable amounts of attention from silently hovering black helicopters filled with expressionless men in black suits. By using improved technology, having riders sign an injury waiver, and disguising the vehicles as tires, Imagineers were able to get past all of these problems. …spelling out the copious rules and suggestions for enjoying the attraction. 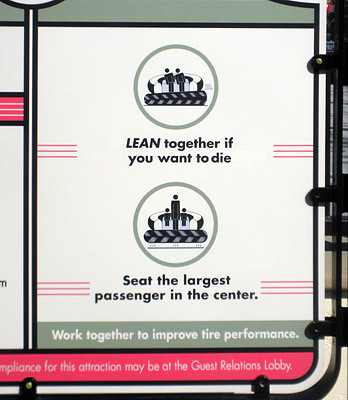 For example, no trying to fly over the attraction’s barriers; no standing tires on their side, connecting them with axles, and building a monster truck; and you may not ride if you are pregnant, hoverphobic, or tired (pun!). The vehicles themselves are fashioned to look like large tires. This is a big surprise to guests who have not been paying attention. The tires hover under the influence of massive electromagnets embedded in the attraction’s surface. The up side to this method of levitation is that it is very powerful, allowing the vehicles to hover with even the largest guest or group of guests aboard. The down side is that after each ride the surface must be searched for keys, glasses, retainers, etc., that have been sucked off riders. Guests passing in wheelchairs may also find themselves irresistibly drawn to the attraction when it is in operation, and the entire area is instantly fatal to anyone with a pacemaker. 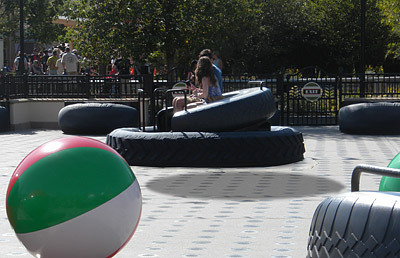 It is a particular irony that an American park named for California would have an Italy-themed attraction featuring beach balls made in China. On our first visit to the new, improved Disney California Adventure, we were so busy exploring and documenting the wonders of the new restrooms that we didn’t have time to properly investigate some of the other exciting new rides and attraction that the park has to offer. We returned yesterday to remedy the situation, only to discover that the park was closed to the public for the day (apparently someone in maintenance had misplaced the key and they had to wait for a locksmith who was, of course, late). Today, the crowds were a little larger (the park reached maximum safe capacity some ten minutes after opening and gates were closed some two hours later), but at least we were able to make our way in. We will be updating the DCA portion of DisneyLies.com shortly with complete information on all the new goodness, but for now, we thought we’d share some of the photos we took during our exploration, starting with three from Radiator Springs Racers. …is quite detailed. Unfortunately, because Cars Land took so long to construct, there is already some evidence of rust and age on what should be sparkling new signage. We didn’t find this particularly irksom as it actually added to the ambiance of the place. 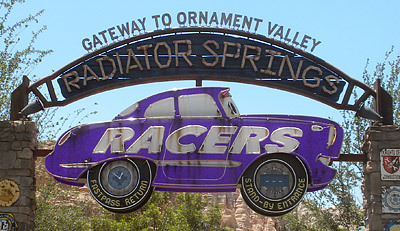 One criticism we had, though, was the color of the car on Racers’ entrance sign. Although we are not Imagineers and assume that everything was done for a reason, we wish that the car had been painted red as a sly nod to Cars’ Lightning McQueen. We have forwarded this suggestion to Disney, and hope that they will implement it in the near future. 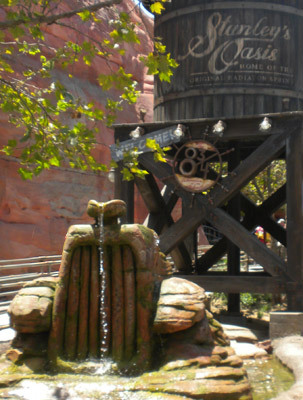 By running multiple cars at once NASCAR-style, Radiator Springs Racers is able to handle some 9,000 guests/hour, which means that at expected crowd levels over the next few weeks, lines should never be more than a few hours long. Want to get a better feeling for why Disneyland’s expenses are so high? 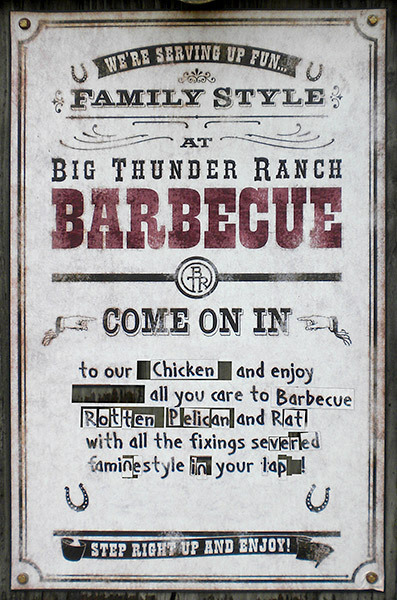 Take a look at the sign from outside Big Thunder Ranch Barbecue as it was discovered after a recent Grad Night. The shame! 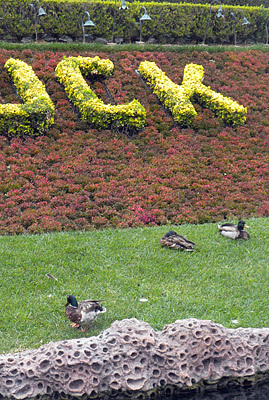 On our last visit to the park, we noticed that, with the warm weather here to stay, the ducks have finally returned to the banks of Disneyland’s Duck Land Canal Boats in significant numbers. Hooray! Because of a media embargo, most Disney-related websites are unable to report on Cars Land until on or after its official opening on June 15. We at DisneyLies.com, rebels that we are, are under no such embargo. So we begin our exclusive coverage of Cars Land with one of the attractions that the embargoed sites dare not discuss until Friday: the Cars Land restroom. …are meticulously detailed and weathered. They really make you want to go to the bathroom! …is tastefully set back from the road and themed like the restrooms of a 1950s diner. 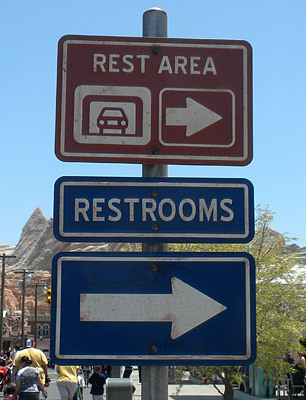 As the sign advertises, each restroom is equipped with an ATM and telephones. The man in this photo is apparently taking advantage of an open-air urinal, which, although innovative, makes us a little uncomfortable so we were unwilling to approach to learn more about it. 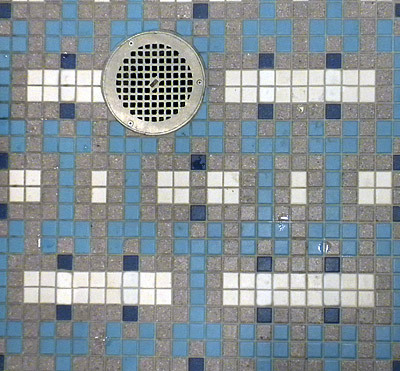 See the long, white rows of rectangles with the four dark-blue squares adjacent? They’re little stylized limousines! And the light blue squares form wrenches, like might be found in an auto-repair shop. How clever! 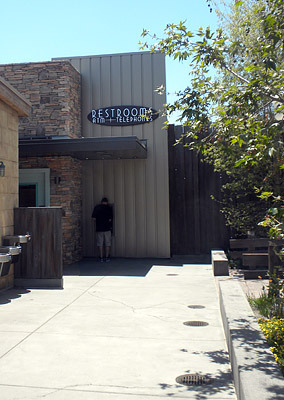 Believe you us, if you’re in Cars Land and have need of a restroom, this is definitely the place to go. No pun intended! During a recent trip to Disneyland, we were headed toward “it’s a small world” in the hope of documenting the new Princess Merida meet-and-greet location that we had heard such wonderful things about. And who should we meet on the way but the Princess herself! We certainly understood that! Thank you, Princess Merida, for the lovely chat — and for the autograph!